Columbia University students plan mass protests to greet Holocaust-denying Iranian President Mahmoud Ahmadinejad when he arrives on campus Monday to give a lecture. Students planning the demonstration on the steps of Low Memorial Library papered the area with posters yesterday depicting public executions of gays in Iran. Any student who cares about freedom of sexuality and freedom of religion should stand up and protest against this murderous dictator, said Sharona Getz, 22, who was taping up signs in the student union. While many plan to protest his terrorist-loving views, it was hard to find a student who thought he should be barred from campus. If we believe in freedom of speech, I think we should let him come, said Iranian law student Matin Hughes, 27. Columbia is barring nonstudents from the campus Monday for security reasons – to the consternation of some protest organizers. Its a perversion of free speech, said Rabbi Avi Weiss, head of the Coalition of Jewish Concerns. Nonstudents will protest outside the campus gates at 116th St. and Broadway. Ahmadinejads visit – his third to New York – comes as Washington is ratcheting up the rhetoric against Iran, accusing the Axis of Evil member of developing nuclear weapons and arming insurgents in Iraq. City Council Speaker Christine Quinn and several other pols and Jewish groups bashed Columbia for the invite, but Mayor Bloomberg, Gov. Spitzer and the White House declined to follow suit. Look, its a university, they have a right to invite who they want. I personally am not going to get involved in criticizing them because I think that is a slippery slope, Bloomberg said. The White House backed him up. Its a free country. We wish the same were true in Iran, White House spokeswoman Dana Perino said. In any event, Ahmadinejad will be well-protected while in town. The State Department has issued him a superrestrictive C-2 visa. It lasts 29 days and the holder must remain within a 25-mile radius of Columbus Circle. Police Commissioner Raymond Kelly warned the Iranian president to stay away from Ground Zero because his appearance could incite crowds. Obviously, Ground Zero has tremendous emotion attached to it and that might affect reaction of crowds, Kelly said. Sharona Getz is Campus Coordinator for the Zionist Organization of America. The Zionist Organization of America, founded in 1897, is the oldest pro-Israel organization in the United States. 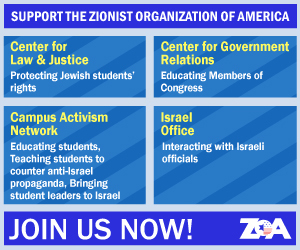 The ZOA works to strengthen U.S.-Israel relations, educates the American public and Congress about the dangers that Israel faces, and combats anti-Israel bias in the media and on college campuses. Its past presidents have included Supreme Court Justice Louis Brandeis and Rabbi Dr. Abba Hillel Silver.